Thank you thank you thank you! Our 2014 Company Christmas Party is very important to us as it is when we are able to show our utmost appreciation to our employees, clients and special friends. Your brilliant Master of Ceremony skills kept the max capacity crowd focused and under control ...your enthusiasm and magic entertained beyond...and you are one great Game Show Host. Your input and ideas to ensure a very successful party were greatly appreciated...you really know what works! Thank you again for making it FUN! PS...they all want you again next year! We invited The Maestro of Magic to attend an annual employee recognition event on December 2, 2014 that we hold at our Hotel each year. The Maestro of Magic performed some magic for our employees at their tables during dinner then hosted the “Wicked Bingo” game for us afterwards, it was awesome! Our employees were engaged, participated and had fun throughout the show. It really made this year’s event special and most of all fun. I would highly recommend The Maestro of Magic! The Maestro of Magic thrilled the children with his magic at the White Rock Princess Party. His entertaining style is interactive and so funny. The children were captured by him. Thank you The Maestro of Magic for bringing the belief in magic back to all of us. Many thanks from PNAA's Board and Staff for your fabulous MC'ing and "magical" entertaining Thursday evening. It was a great show filled with many laughs and we all enjoyed watching and being involved with your antics. With over 85 attendees, good food, great aerospace camaraderie and smiling faces on all………you helped make PNAA's 4th Annual Holiday Party on 12/05/12 a great success. WOW! How did he do that? Thank you The Maestro of Magic for making our fund-raiser a magical event. Your ability to dialogue with the crowd while keeping them enthralled with a slight of hand was truly magical and a sight you have to see to believe. We absolutely will be calling upon your services again in the future and I would have no hesitation recommending you to anyone who needs to add fun to their party!! We hired Dr. Strange to perform at a party of adults and it's all everybody said it was "the highlight of the night!" Extremely entertaining, his show puts a child-like wonder into people of any age. Just want to let you know how AMAZING your show was on Friday and how much everyone-campers and counselors- enjoyed it! Thank you so much for coming in and making it so awesome. Just wanted to say Thank you for a great show on Friday. Everyone really enjoyed it and thought it was excellent! I was so pleased – I have never seen the staff have such a good time! Thanks for making my Staff Christmas Luncheon a huge success! Wow! What energy and organization. Stephen (The Maestro of Magic) Kaplan made our event run smoothly with the kind of enthusiasm that added to the electricity of the evening. Everyone was amazed at his talent as an auctioneer, which also gave the final part of our event the professional touch we were looking for as a last impression. Thank you so much, Stephen, for acting as MC, ante-caller and auctioneer for the second time for the 2nd Annual CHW Hearts Are Wild Poker Evening. Stephen (The Maestro of Magic) conducted the event in a professional and entertaining manner, with just the right amount of humour, and ended off the afternoon with some magic which entertained all the participants and left them on a happy, satisfied and high note. We would certainly recommend him for any similar functions. "Thank you so much for your professionalism and expertise in making the MOTHER'S DAY AROUND THE WORLD event a success... you were so FANTASTIC to work with!!" "The Maestro of Magic raised the roof at our annual City of Vancouver United Way thank you luncheon celebration. His comedic delivery and amazing magic found the funny bone and truly turned our event into something special. You'll not only laugh through lunch, you'll be laughing for days afterwards. A true professional !" "Dear The Maestro of Magic, I would like to thank you for the fabulous show you put on for our Scouting group at our Christmas Banquet in early December. 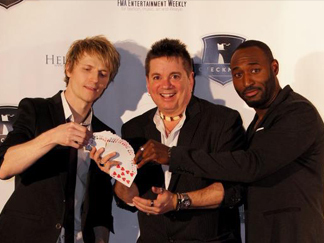 We have had several magicians in the previous years and your show was the best by far. It was very engaging for everyone present from the younger siblings (3 year olds) to the very seasoned Scouter! People are still talking about the show and wondering how you did all those things! Thanks again!" ~ John Nomellini 9th Richmond Scouting group. The Maestro of Magic made our staff appreciation party so much more fun, two years in a row! He is a gifted magician, a fantastic Emcee, and an execellent entertainer!" " - your sense of humour was fabulous! ... we presented you with a long agenda of tasks to be handled through the evening you kept everyone engaged and laughing through the night. Your skills with magic truly impressed the crowd"
"We thoroughly enjoyed our Laugh Thru Lunch performance by The Maestro of Magic. His show was totally entertaining and left our office in a “buzz”. We like to think of ourselves as clever people… but we were completely mystified and perplexed by his routine." ~ Gary Mix, General Manager, Synergy Marketing Group Inc. The Maestro of Magic was able to weave between our guests and highlight our corporate sponsors in such away that is was engaging, informative and most of all entertaining! His quick wit, smooth slight of hand tricks and natural charm was a memorable component to our program. He added versatility and comic relief during our live auction, thus resulting in fantastic bids. It was a pleasure to work with The Maestro of Magic and our calendars are marked for next year. The Magic of The Maestro of Magic All Right Reserved © 2012.